Camera Mounting Plate Quick Release Plate fr DJI RONIN-M Gimbal FS700 BMCC RED. Batter for heavy/long camera body, such as sony, Bmcc camera. Use this extension plate, you can tune the balance easily. 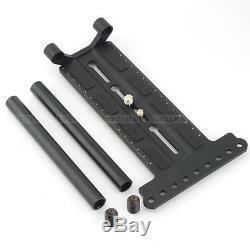 It comes with rod support system, it is compatible with DSLR rig 15mm rod support system, you can mount order rig part on. It, such as lens Support, matte box kit. It comes with 9x 1/4 threaded mounting holes for counterweight. 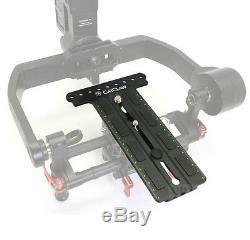 It will assist you to adjust the balance of gimbal. It is fully compatible with DJI RONIN-M handheld gimbal, easy installation. You may also be interested in the following item(s). 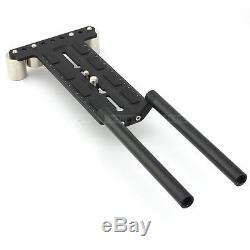 Riser Rod Clamp Rail Block fr Light Weight Studio Support Rail DSLR Rig V2. 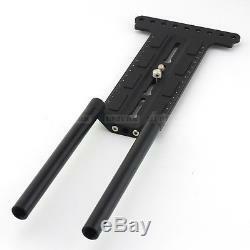 Rod Clamp Rail Block + 1/4" 3/8" Cheese Plate Mount fr Support DSLR Rig V2. 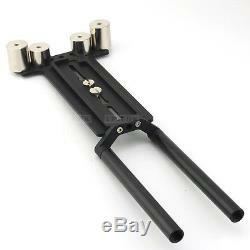 Vertical Mount Cheese Plate Base Rod Clamp fr 15mm Rod Support DSLR Rig Rail V2. 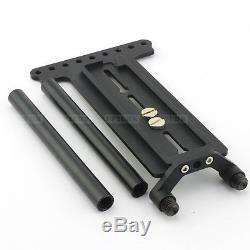 Adapter Rod Clamp Rail Block fr 15mm Rod Support Rail DSLR Rig Stabilizer Mount. 15mm 19mm Rod Adapter Clamp Rail Block fr Light Weight Studio Support Rail Rig. Model: Extension plate for DJI RONIN-M. 1x 1/4" screw and 1x 3/8" screw for camera. Spacing of two rod (center to center): 60mm. Camera Mounting Plate Quick Release Plate fr DJI RONIN-M Gimbal FS700 BMCC RED Please note: the counterweight is not included. Appreciate your 3 seconds to read the following. You can get 6 month guarantee (from the date of sale). Your satisfaction is most important to us, We depend on your satisfaction to suceed. 15MM ROD CLAMP RAIL BLOCK ESSENTIAL. Tripod Mount Plate Rod Clamp fr 15mm Rod Clamp. Shoulder Pad Rod Clamp Block fr Rod Support System. Tripod Mount Cheese Plate Rod Clamp fr DSLR Railblock. 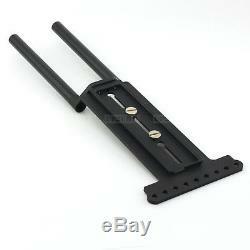 Cable Lock HDMI Saver 15mm Rod Clamp Rail Block. Lens Support Rail Block 15mm Rod Clamp fr Rig System. Vertical Mount Cheese Plate Rod Clamp Kit fr Rod System. 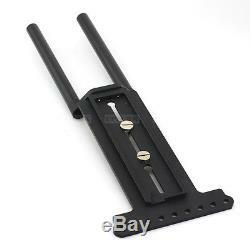 360 Degree Adjustable Rod Clamp fr 15mm Rod Support. 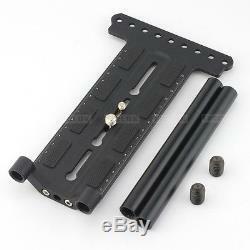 Z-Shape Offset Bevel Rod Clamp fr 15mm rod DSLR. 1/4 D-ring Screw Rod Clamp fr Rod Support Rail System. 1/4 Screw Rod Clamp Holder fr Rod Support Rail System. Rod Clamp Offset Holder Extender fr Rod Support System. Hotshoe Mount Magic Arm Rod Clamp Bracket fr Rod System. Extender Riser Rod Clamp Rail Block fr Rail System. Lens Support Rail Block Rod Clamp fr 15mm Rail System. 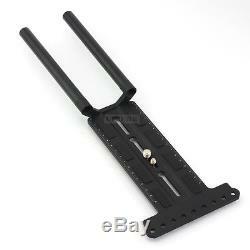 1/4 Camera Mount Adapter Plate Clamp fr Rod Support. 360° Rosette Rod Clamp Rail Block fr 15mm Rod System. HDMI Saver Cable Lock Clamp Mount Cheese Plate. 90° Rod Clamp Railblock fr 15mm Rail System. The item "Camera Mounting Plate Quick Release Plate fr DJI RONIN-M Gimbal FS700 BMCC RED" is in sale since Saturday, April 1, 2017. This item is in the category "Cameras & Photo\Film Photography\Movie Camera Accessories". The seller is "up2uhk" and is located in Shipped by AIR MAIL. This item can be shipped worldwide.